"Conceived by renowned game designer Paolo Mori, Dogs of War is an elegant game set in a steampunk-influenced renaissance universe. Noble houses engage each other in a series of fierce battles, and it is up to the players and the Dogs of War they control to deploy their private armies in support of whatever house they wish to favor. 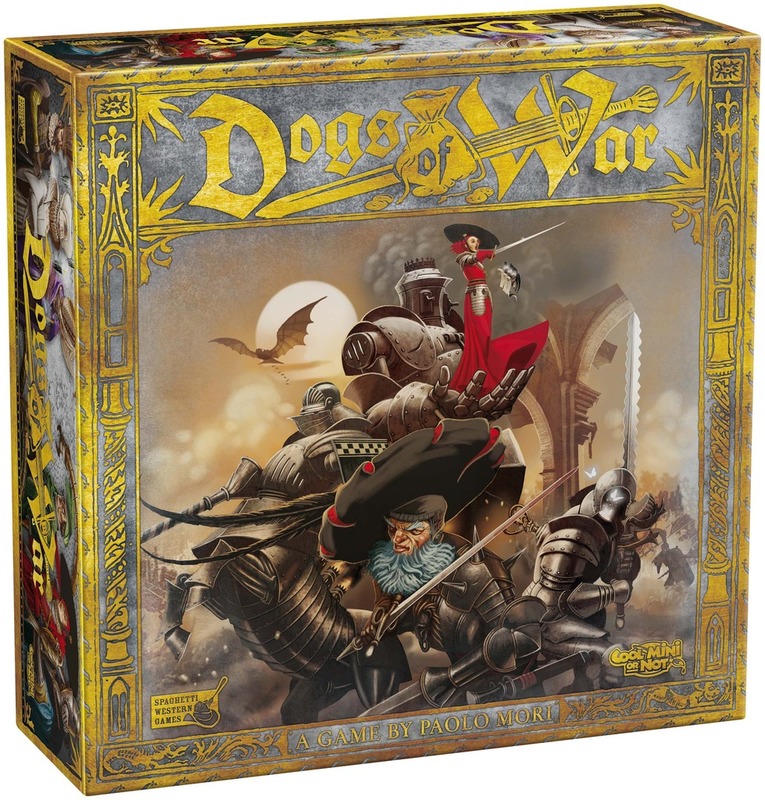 Clockwork knights and imposing war machines shift the tides of war as they enter the battlefields, but the interest of their Dog of War captains actually lie in the rewards offered by each noble house to its supporters. Players will want to gain influence with the noble houses and make sure those houses are victorious in battle so that their influence is more valuable at the end of the game. Thus the Dogs of War flock to support a house on the rise and are all too quick to betray their previous patrons if things go awry. There are several pathways to victory, from crushing your opponents in battle to managing to gain influence with the right houses, or simply reaping the best battle rewards offered by them." I usually reserve my 'this is a great looking game and has high production values' comments for another publisher Who I Will Not Name, but if I didn't know better I'd assume that this wonderfully illustrated and hefty box had been produced by that other publisher Who I Will Not Name and had followed their usual standard. I'm new to Cool Mini Or Not and straight away I'm impressed by their product. It's well packed, there's plenty of components and it feels like a worthwhile spend of RRP £44.99. It's at all gaming stores now, so find your local store here. Speaking of contents, inside the hardy box you get a game board, coins and tokens of various use, cards for all occasions, some nifty player's screens that keep your machinations secret, and some plainly coloured but well sculpted playing pieces, like busts, that act as representations of the mercenary captain each player wants to play. It's all of very good quality and there's plenty of material, so at first it may seem a little daunting and complicated but it really isn't that bad once you get into the flow of the game. 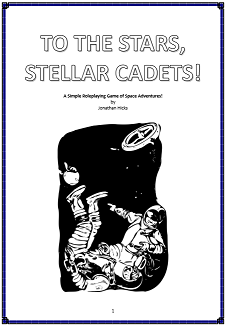 And what a simple game it is - after a game overview there's just six pages of rules that are easily interpreted and will get you up and running in about an hour, based on playing the game with three players as we did. 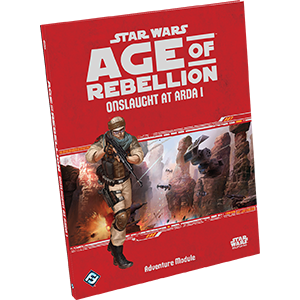 In fact, the majority of the rulebook is background material which fills you in with the backstory of each of the captains and the world they live in. It's the kind of thing you'd expect to see in a wargame or tabletop RPG, and it's an interesting world and adds flavour but doesn't influence gameplay. 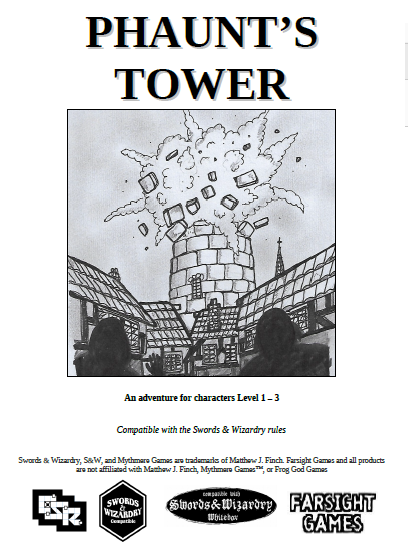 It's at this point I'd usually explain how the game works, but you can download the rules for free here and straight away you can see how the game works, what's involved and read about the history of the world. So let me tell you how this game worked for us. First and foremost, we had a lot of fun with it. It was easy to grasp but even though we were playing with the minimum number of players - it's for 3 to 5 people - it did take a while to get set up correctly. I think our mistake was handing the rulebook around, but what we should have done was leave it with one person to instruct the others and then step in if they weren't sure about something. So, we chose our captains and regaled each other with stories about the mercenary we had chosen. That's not part of the game, we just did that for fun, but after reading the background it seemed a shame not to reference it and add some atmosphere. Then we started to hire armies and choose our battles. It was going swimmingly... and then the scheming started. And with scheming come suspicion. And with suspicion comes ATTACK HIM FIRST BEFORE HE DOES THE SAME TO ME, GODDAMIT! This is where Dogs of War is a very fun game. You choose where to place your captains to win the victory and claim the prize, but it also pits you against the other players around the table as well as form uneasy - and potentially fatal - alliances. We were choosing the house we wished to support and then started to commit. At first we were enjoying the game but it really doesn't take long before you realise that everyone around that table that's not you wants you to fail. And fail big time. So, all you can do is hit back. I can't go into what was actually said - the language is far too colourful - but there were some amazingly heated debates around the table that night, and once it rose to fever pitch we called it a night, with the promise that we would play again with cooler heads. Don't get me wrong; this game may seem like it makes you hate your friends, and that they hate you, but that's the fun of it - there are games out there where you play, lose, then graciously shake the hand of your opponent with a muttered 'good game'. Not Dogs of War. We were ready to flip the table, accuse each other of either betrayal or simply cheating, and start jamming the pieces where they weren't supposed to go. This game isn't just about winning tokens or cards, it's about being the best and everyone - everyone - wants to be the best. Perhaps we missed the point. Perhaps it was just meant to be a simple strategy game that you'd play for an evening and have a good laugh about, but that's not what happened. I blame the fact that there's no dice, no element of chance so that you can say 'that's the luck of the draw' and blame it on fate. Although there is an element of chance, it's primarily down to the decisions and deviousness of the players, and that's what makes it playable over and over again. Dogs of War is a cracking game. It won't tear friends apart but it will certainly make for some interesting conversations both during and after the game and it makes for an evening of surprises and shocks. It makes me laugh even now how fast alliances would change every turn, and that 'what will happen next?' factor will make you want to come back to it on a regular basis. 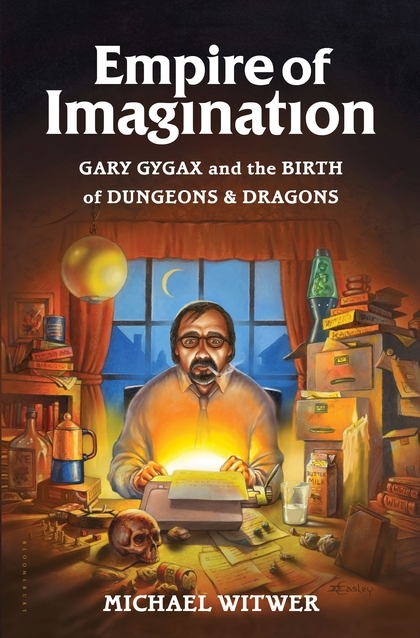 "Here, for the first time, is a comprehensive biography of the mythic icon among geek and gaming culture, Gary Gygax - and the complete story behind the invention of Dungeons & Dragons. Gygax's involvement in the industry lasted long after his dramatic and involuntary departure from D&D's parent company, TSR, and his footprint can be seen in the genre he is largely responsible for creating. But as Witwer shows, perhaps the most compelling facet of his life and work was his unwavering commitment to the power of creativity in the face of myriad sources of adversity - cultural, economic, and personal. Through his creation of the role-playing genre, Gygax gave generations of gamers the tools to invent characters and entire worlds in their minds. Told in narrative-driven and dramatic fashion, Witwer has written an engaging chronicle of the life and legacy of this emperor of imagination." I thought I knew about the history of D&D. I've tried to start this review several times from several angles; my feelings about biographies, my history of gaming, my own experiences with the industry, and how gaming has both changed and influenced my life. The problem is, every one of my personal opinions and experiences cannot make a good introduction to this review because this book is about the man who was instrumental in bringing me the hobby that I love so much. Any one of my anecdotes about how gaming changed my life, no matter how huge and explosive it was, would pale into insignificance compared to the life, history and involvement of Gary Gygax; the man who was the game. I first became aware of Empire of Imagination earlier this year and my excitement for the book's publication was inflated by an interview with the book's author, Michael Witwer. I felt I already knew a lot about the history of gaming, especially TSR, through other excellent books but what I wanted was something more personal, a more closer-to-the-heart account of what happened. So, when I found out that not only would we be finding out about the man himself but also the tumultuous beginnings of the D&D brand, I was left salivating with expectation. The 320-page hardback book, with a lavish Jeff Easley front cover that emulates the AD&D manual 'Unearthed Arcana', landed on my desk on Thursday. By Friday I had cleared my reading schedule to sit down and read. By Sunday morning I had finished the book. Gary Gygax went on a long, treacherous and challenging journey in both his personal and business life and, after reading Michael Witwer's book, I feel as though I've been on a part of that journey, too. The book begins with a pivotal moment in his life - the moment he was ousted from TSR in 1985. This was something that I, and no doubt many gamers, already knew, but then we go back and begin the long journey to this point with details of Gary's childhood life, from a neighbourhood scuffle in the summer of 1948 onwards. These different chapters of his life (referred to as 'Levels', which is an excellent reference to the D&D game but also makes sense as Gary grows, experiences more and more and matures as a man, father and grandfather) are opened with short scripted roleplaying sessions, with an unnamed Dungeon Master guiding a player, Egary, through a long campaign on a quest to find the Key of Revelation. It's a lovely, affectionate addition to the book and after reading it fully I'm sure that Gary Gygax would have had something of a good chortle to himself at the references. The writing style itself jumps between plain, explanatory narrative to dramatisation. Dramatising events can be something I find contentious, because how could the incident be even remotely correct? How do we know what people were thinking, what their motivations were? However, Michael Witwer does an excellent job making sure that the drama in the book doesn't overshadow the facts that he has gathered from his long, rigorous research, including interviews with many friends, colleagues, business partners and family. He even states in his opening Author's Note; "In many cases, scenes and dialogue have been re-created, combined, and in some instances imagined to best support the known documentary record". You can't say fairer than that. He isn't trying to say that the dramatisations are accurate, but an effective way of communicating what happened. The rest of the narrative, between these moments of semi-fiction, reads as an account of the incidents from as many different angles as he could gather. If there are areas of contention, or conflicting stories, he addresses them both. So, did I really have a problem with the dramatised aspects of the story and did they ruin my perhaps unrealistic expectations of being told an accurate story? Well, yes and no. While there will always be a part of me that thinks 'How could you know that? ", the long list of people that Michael Witwer acknowledges in the book, all the friends, family and associates that knew Gary Gygax over the years and spoke to the author, and who no doubt shared their personal stories, makes me certain that the story is as accurate as it can be, as accurate as Michael can make it. With every quote and reference there is always a note as to where he gathered the information so every point is covered by his investigations, and that gives me the root in fact that I required. The book has truly been well researched. The writing is informative and doesn't feel like a dry wall of text. He tries to get across the feelings and emotions of certain moments but doesn't push it, but many times you don't need to be told how people felt or what feelings were running high - just by reading what happened is enough to leave you feeling somewhat exasperated and more than once I shook my head and mumbled 'Why did they let that happen?'. I have the power of hindsight, which makes it all the more frustrating as you read what happens leading up to the key moments in Gary's life, and you see the seeds of destruction planted many, many years before. From bad business decisions, to key people bought in who would change things for the worst, from misrepresentation in the media to the breakdown of friendships, it's all here. It was his post-TSR days where I also learned a lot, finding out what he got up to after he was ousted. This was a part of Gary's life that I never truly followed as he was always the 'D&D Guy' to me, but learning more about his work on Dangerous Dimensions and Lejendary Journeys was informative and enlightening. On top of all this we understand the legacy he left behind, the ongoing influences that he and his game still have to this day. He truly did change people's lives, across the world. And I can agree with that, because I was one of those people. So, essentially, what we have is the story of a man who grew up with a fiery imagination and managed to communicate his dreams to the masses; but the details - the relationships, friendships, loves and betrayals - make for a compelling and sometimes bittersweet story of a man beloved by millions. The book left me feeling warm and yet somewhat sad, but it was definitely a most satisfying read. It also made me want to call up some of my old gaming friends, from way back in the 1980s, and get an old-school D&D game on the go. At the end of it all - after all the work, strife, arguments, law suits, and personal hardships - Gary Gygax just loved to play games. And I feel that playing those games, and keeping the tabletop fires burning, is the best way to honour him. I thought I knew about the history of D&D. As it turns out... I really didn't. Stories by: Matt Ward, Sarah Newton, Jonathan Green, Ben Counter, M. Harold Page, Mark A. Latham, M.J. Dougherty, Karen McCullough, David A. McIntee, Duncan Molloy and Graeme Davis. One thing that I missed from the Frostgrave: Fantasy Wargames in the Frozen City core rulebook was a defined setting. We knew about the city of Felstad and that the Empire around this once mighty city fell into almost ruin when the city was encompassed in the ice, but the lands that surrounded it, what was left of the Empire that now produced these warbands hoping to learn and loot from the thawing metropolis, was a mystery. I was hoping that this book of eleven stories set in the world of Frostgrave might shed some light on this background and, while it does provide some tantalising glimpses of the world beyond the city, it doesn't really fill in any blanks or fill out the setting. In fact, it gives only snapshots of life beyond the city and doesn't world-build at all. The game the stories are based on is, after all, a wargame, and the nature of the short sharp stories reflects the short sharp fights that the game creates. This works for the nature of the game, sure, but as a reader who wanted to explore the world this didn't give me what I was looking for. The stories are very short and build some excellent little pictures of the kind of situations that warbands will find themselves in, but where many short stories are paintings on a greater canvas, these felt much more like sketches of those paintings. The stories didn't really give much time for characterisation, but the motivations of the characters is already defined by the nature of the game; wizards and warbands searching out and unlocking the secrets of this once great city. The stories don't contain very much in the way of characters that you can really feel for or empathise with. At first I felt this was going to disconnect me from the stories as if I couldn't care for the people involved then why should I care about the story as a whole? 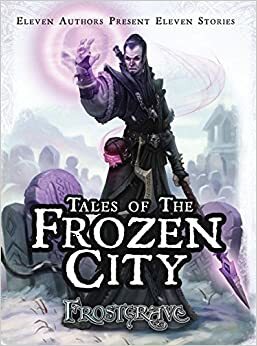 I ended up really enjoying Tales of the Frozen City. 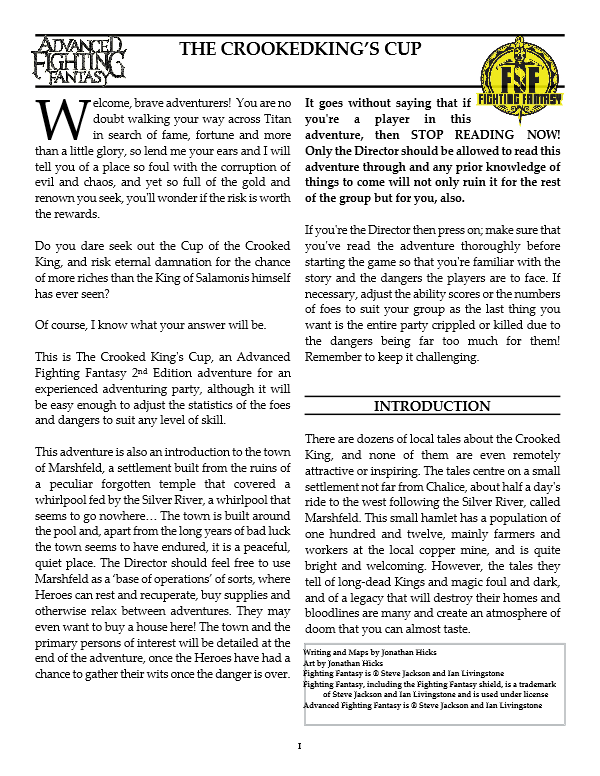 At first I was a little concerned that I'd be indifferent to the short adventures as I wasn't really feeling anything towards the characters, but once I realised that I was reading about the city itself it gave me a whole new appreciation of the book, as well as give me some great ideas for scenarios in the game and pointers to how I should be designing my own encounters. If you're a fan of Frostgrave then buy this book - I doubt you'll regret it. If you're not yet exploring the Frozen City but considering taking the plunge, then this might give you a good starting point to experience the setting and the kind of things you can expect. If you're new to the setting or just a fantasy fan in general then you might get some enjoyment out of the stories but don't expect any multi-layered depth; the stories are too short for that kind of detail. I enjoyed the stories and, even though I didn't get that setting background I really wanted, I can recommend it. 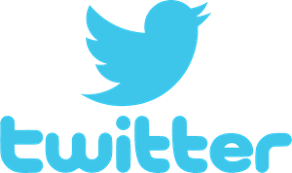 Hello Joseph, and welcome to Farsight Blogger. First of all, tell us a bit about yourself and how you got into this glorious hobby. Thanks for inviting me. My story begins in Greensboro, NC. My parents were both sci-fi/fantasy fans, so I was already well-versed in some of the classic fantasy worlds like Narnia and Middle-Earth before I could read. My first contact with gaming came when I picked up a D&D box set from a yard sale when I was 8. I didn’t really understand the game, but I knew it was for me. Soon thereafter my father became my first Dungeon Master, for a Middle-Earth Role-Playing campaign. He’d never role-played before, but I think he enjoyed it. He even painted up a few miniatures. Role-playing became my number one hobby as a teenager, and I took this straight into college at UNC where I spent most of my time (underground) at the local game store, Cerebral Hobbies. I probably played just about every RPG that was popular at the time. My favourites were AD&D, GURPS, CoC, Warhammer Fantasy Role-Play, and Deadlands. Along with this, I played a few miniature wargames. I had always loved painting miniatures, it was just a great way to relax on my own. Some years after college, I decided to go for an MFA in Creative Writing and made the unusual step of travelling to Bangor in North Wales to do it. I didn’t complete the course, but I met my future wife, so it worked out. After we were married, I relocated to the UK. A year or so later, I got a job with Osprey Publishing in the production department. Nine years later, I’m still here. 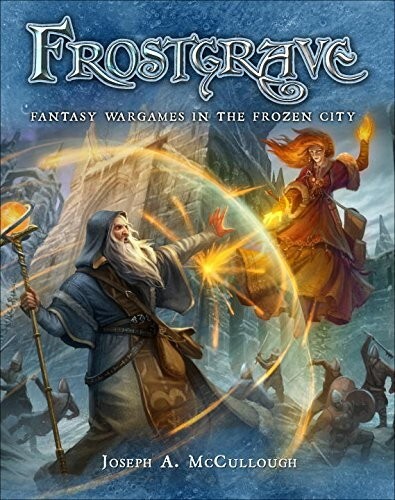 Frostgrave: Fantasy Wargames in the Frozen City has been received really well and is doing great on the wargaming scene. How did the idea of a ruleset for just wizards and warbands come about? From my miniatures collection! Over the years I have painted loads of wizards, but except for the very occasional RPG character, there never seemed to be much use for them. Since, in the UK, I’ve mainly become a wargamer, I kept looking for a wargame that featured wizards, but I could never find one I liked. So, I just decided to write my own. The setting of the Frozen City, with a vast location covered in ice and snow and slowly thawing out to reveal centuries-old secrets, is extremely evocative. How and why did you come up with such a setting? I knew I wanted to set the game somewhere really dangerous. I wanted players to feel that they not only had to contend with their opponents, but also with the table itself. Wizards are such powerful individuals, you need a scary location to challenge them. A ruined magical city worked perfect, both to give the wizards a reason to be there, but also allows infinite scope for creating dangerous, deadly, and just plain weird scenarios. The idea of making it ‘frosty’…that was partly to up the danger factor one more level, but also to do something a little different. I suppose cold fantasy has become much more popular in the last few years, but there don’t seem to be many miniature games that embrace it. Is there a larger world to the setting? There isn't a lot of background detail in the rulebook but in the 'Frostgrave – Tales of the Frozen City' fiction anthology there's tantalizing glimpses of life outside the primary location. Will you be exploring that at all? There is more, and bits and pieces will be revealed slowly. However, I am someone who very much likes to keep his setting blurry around the edges. For one thing, the ‘there be monsters’ part of the map tends to be where most of the adventuring occurs, but also, I want players to feel very free to take the setting and use it any way they like. I think one of the reasons the game has caught on to the extent it has is that players enjoy being able to use whatever miniatures they want and making up a back story for them. Are you looking to expand the rules? There's new campaigns coming out soon but do you have any plans for rules regarding other situations, for example large-scale combat and sieges? For now, I’m looking to expand in depth, give players more options for customizing their warbands, new scenarios, and expanded rules for adventuring, such as fighting battles underground. Bigger battles could happen someday, but, in truth, I can’t see myself writing it. Larger wargames take a different kind of design philosophy that is much more numbers intensive and usually less narrative focused. I’m not sure I’m the best person to write that kind of game. The setting - with it's long-lost ruins, empty towers and dark halls - is pretty much perfect for an old-school dungeon-basher such as myself. 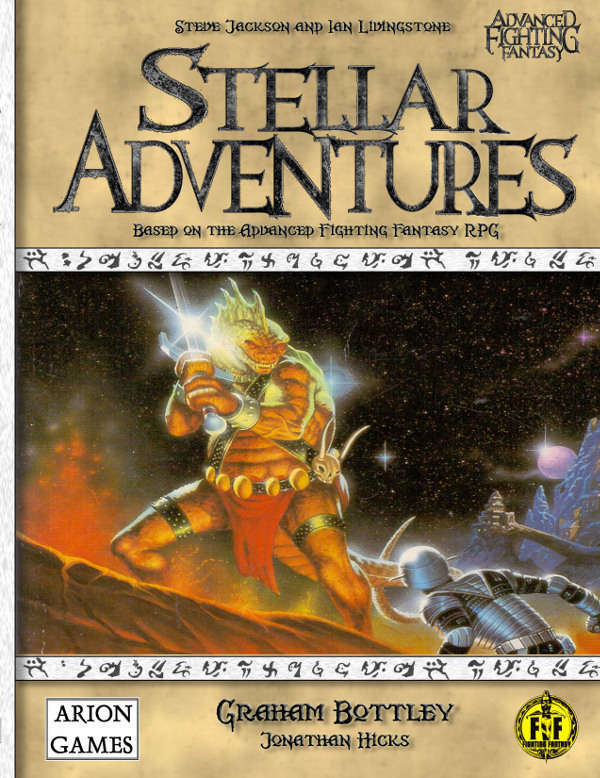 Any chance of a tabletop roleplaying version of the game? That’s something I would be better-positioned and more likely to write, and there has been talk about it being a possibility. For the moment though, my schedule is taken up with writing new material for the main game, so it will be a while if it happens. What else can we expect to see for Frostgrave in the future? I don't usually post about crowdfunders, but this show was an integral part of my childhood and I've always dreamed of some kind of continuation following 'The Time of the Wolf'. 'Robin of Sherwood had everything - swords, sorcery, a very angry Ray Winstone, bucketloads of dry ice, even a man with a deer on his head. Now, thirty years on, the original cast – including Jason Connery, Clive Mantle, Judi Trott, Nickolas Grace, Mark Ryan, Phil Rose and, yes, Ray Winstone – are getting back together for a one-off audio adventure, The Knights of the Apocalypse. 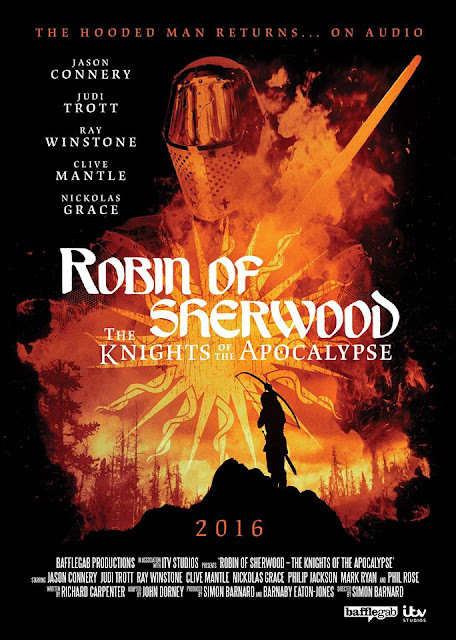 The Knights of the Apocalypse was written after the end of the series by the creator of Robin of Sherwood, Richard 'Kip' Carpenter, but never filmed. In tribute to Kip, who died in 2012, every penny in profit will go to his favourite charities. A year after my interview with Joe Theis of Lone Wolf Development, I caught up with Liz Theis to find out more about the recent release of the Hero Lab Class Packs for Pathfinder. Welcome back to Farsight Blogger - it's been over a year since we last spoke, so what's Lone Wolf Development been up to in that time? It’s great to be back! Since you spoke to Joe over a year ago, we’ve had a lot of new updates for both Realm Works and Hero Lab – Realm Works Player Edition, Pathfinder character creation on Hero Lab for iPad, Pathfinder Adventure Paths for Hero Lab, and now our new Pathfinder Class Packs. In fact, Hero Lab recently won its third ENnie Award due to these fantastic releases! Realm Works and Hero Lab are two great accessories but you've now got Hero Lab Class Packs for Pathfinder out. Can you go into more detail about this and how it benefits a gaming group? The goal of Class Packs is simple – make it simpler and less expensive for players to get started with Hero Lab. When talking to Pathfinder players, we found that many play the same few classes but want all the character creation options from seven essential rulebooks: the Pathfinder Core Rulebook, Advanced Player's Guide, Ultimate Combat, Ultimate Magic, Advanced Class Guide, Occult Adventures, and Ultimate Intrigue (when it releases in spring 2016). With our traditional entry path into Hero Lab, you unlocked the classes and character creation content from the Pathfinder Core Rulebook for $29.99, and purchased additional add-ons for $9.99 each to unlock options from the other six rulebooks. This was a great option for players that wanted many different class options, especially Game Masters. But it was prohibitive for the players that wanted to play characters from only a handful of classes, and wanted feats, gear, and spells from all those books. With the new Class Pack entry path, you unlock 3-4 classes and everything from those seven essential rulebooks for just $29.99. For example, if you select the Druid Class Pack, you’ll unlock the Druid, Oracle, Shaman, and Spiritualist classes, allowing you to build characters from those four classes in Hero Lab. Down the road, you can add more classes by picking up additional Class Packs for only $6.99 each. Class Packs are a great way for Pathfinder players to start building characters Hero Lab, at an affordable price! [laughs] I’d love to give the inside scoop, but I don’t have much more information than is already publicly available. Personally, I love playing the group “talker” – a character with high charisma and a ton of ranks in Diplomacy. I’m looking forward to trying out the social combat rules, where you’re dueling with words rather than weapons. Knowing the creativity of the Paizo staff, I’m sure there will be some fantastic new feats and gear to accompany this new combat style. What else can we expect to see from Lone Wolf Development in the near future? Recently we started selling Pathfinder Adventure Path packages in Hero Lab. Each AP package includes pre-made encounters from all six-chapters, for easy use in your game. Our first three Adventure Path packages were Rise of the Runelords Anniversary Edition, Iron Gods, and Giantslayer. Pathfinder GMs have had great things to say about the packages, so we decided to support the newest AP – Hell’s Rebels. Earlier this month, we released the encounters for the first Chapter – In Hell’s Bright Shadow. We’re really excited, as this is the first AP that we’re updating as Paizo releases the new chapters. On the Realm Works side, the Realm Works team is making steady progress towards the Content Market and web-access now that Realm Works Player Edition is available. When the Content Market releases, Realm Works users will be able to purchase incredible published material, like Frog God Games’ “Razor Coast” and “Pirate’s Guide to Freeport” from Green Ronin Publishing. Realm Works web-access will be a nice complement to the Content Market, allowing GMs and players to explore their worlds and stories through the web. If you missed our sneak peak of Realm Works on the web, you can view it on our website. I’ll definitely be back here once these two big releases are available to our users! In the meantime, if you’re not familiar with Realm Works, our campaign management tool, you can learn more on our website: www.GetRealmWorks.com. In addition to the Adventure Paths in Hero Lab and the Realm Works Content Market and web-access, we have a lot more planned! The best way to get the latest news from Lone Wolf is to sign up for our monthly newsletter. If you’re not a newsletter person, I recommend checking out Realm Works or Hero Lab on Facebook, or following us on Twitter and/or Google+. Thanks for your time, Liz! 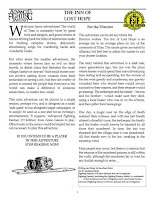 I've said it before and I'll say it again - reviewing adventures for a roleplaying game is a difficult thing to do. Give too much away and it could ruin entire sessions for a gaming group, give too little and what's the point? I can't just say 'this is really good'. Although, I wish I could say that - because this really is good. As with all Fantasy Flight Games products the quality is of a high standard, with full-colour throughout and wonderful atmospheric artwork. The adventure is a simple story but it is told with the flair that you'd expect from Star Wars; daring Imperial assaults, desperate fleeing Rebels and dark, dangerous traitors. There's plenty for everyone to do in this book and it'll suit both the careful strategic player and the guns-blazing rip-roaring adventurer. 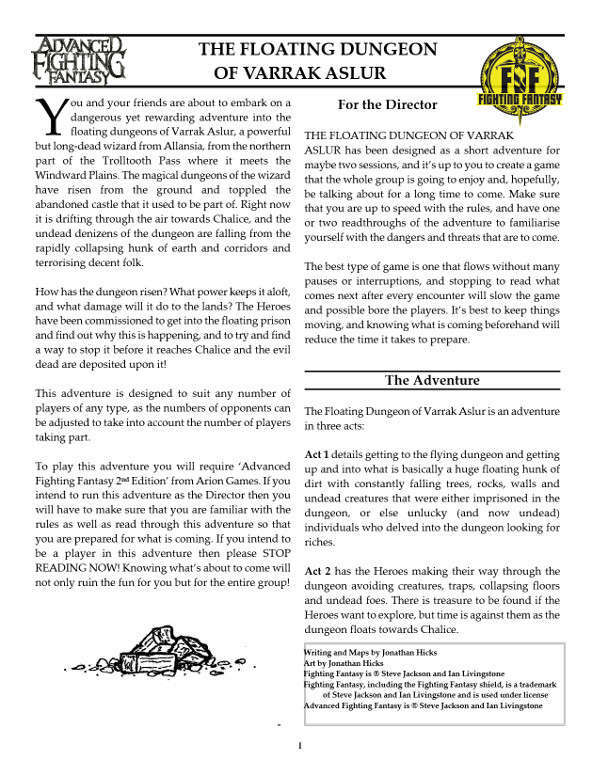 Not only is the 96-page adventure a great yarn with extra vehicles and adversaries, it also features mass combat rules so that you can recreate those huge battles you've seen on-screen. It's a great little system that's detailed enough to make battles fun and dynamic, but simple enough so that it doesn't overshadow the PC gameplay by removing the players from the adventure while you play a mini-game on it's own. 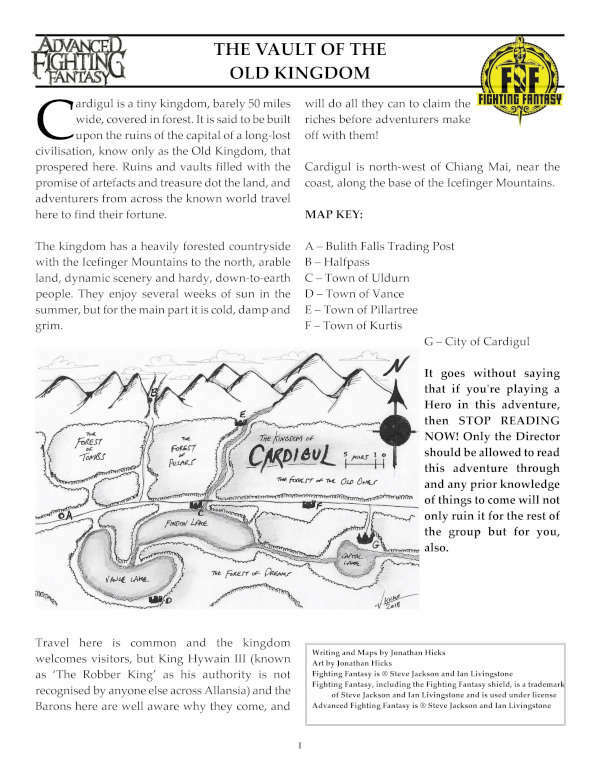 These new rules aside, the adventure also has a gazetteer for new locations but it can feel a little railroaded sometimes; such is the nature of published adventures, but it does make up for this by giving the GM a great open area where they can create their own adventures, or use the location as a visiting point. There are no less than three worlds that the players will jump between, so there's a lot to do and experience. Onslaught at Arda I is a fun adventure that feels a little restrictive in the first act but then really opens up with much more open locations as the game progresses. Even after the game is over the GM can use the new locations, and the extra vehicle and adversary stats, as well as the mass combat rules, really help fill the game out and make it a worthwhile purchase. I was a fan of Buffy the Vampire Slayer back in the day. I have the DVDs of every season, along with Angel, I had the season companions and I dabbled in the comics. I never really fell into it one hundred percent and it became one of my many nerd joys. What drove the show for me were the characters - I don't think there was single character I didn't like in one way or another, and the baddies were just as much fun and could be as multi-layered as the primary heroes. Seven years of vamp-dusting and demon-busting later and we were left with an exhilarating conclusion to a great show. When Demons of the Hellmouth: A Guide for Slayers landed on my desk I wasn't too sure what to make of it - I had my companions and I had seen the show, so what was this going to tell me that I didn't already know? As it turned out, not a lot, but that's not why I enjoyed the book. The book has been written as if Buffy's Watcher, Rupert Giles, has put his thoughts and experiences in order and put them down for prosperity. With little hand-written notes from Buffy, Faith, Willow and Xander sitting alongside the main text, it's a funny and somewhat nostalgic trip into the lore of the Buffy universe. That nostalgia worked for me on many levels; I've not watched the DVDs for years but to see all the old Big Bads again and reading what Giles thought of them - as well as the funny little notes from the rest of the group - was a treat. Sadly, if you're not a Buffy fan or if you're expecting to learn something new about the universe, well I'm afraid this might not be for you. If you're not a fan then you'll not fully understand these characters and miss a lot of the in-jokes, and if you watch the series on a regular basis you'll find it all a little superfluous. But if you were a fan and you've not stepped into the lore for a long time the nostalgia trip is excellent. It's also a great-looking hardback book with a faux-leather cover and elastic bookmark, so it's great for collectors. Recommended for fans of the Scooby Gang. "Command your armies and battle for the Herakon Cluster in Forbidden Stars, a Warhammer 40,000 board game of interplanetary conquest for two to four players! 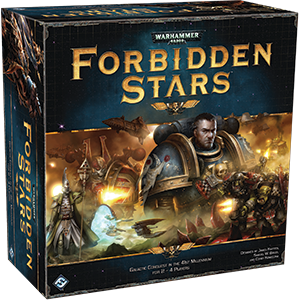 Forbidden Stars puts you in command of massive armies battling to claim the Herakon Cluster at any cost. In every game, you and your opponents build up your forces, expand your strategic options, and clash on the field of glorious battle. You’ll deliver orders to your troops on a strategic level and command your armies through tense tactical battles as you fight to claim your objectives. The first player to capture his objective tokens is the victor, but your opponents will undoubtedly defend them against you. You’ll need all your strategic skill to outwit and outmaneuver your opponents and claim the Herakon Cluster!" I don't get to play board games that often so I like my sessions to have a certain level of complication; not too confusing that I'll need a degree in Tabletop Gaming Theory to understand it, and not so simple that I can learn it in five minutes, play it in ten, and be home in time for cornflakes. It was with a sense of trepidation, then, that I unwrapped Fantasy Flight Games' (FFG) newest offering 'Forbidden Stars'. I'm a big fan of the grimdark gothic universe of Warhammer 40,000. I like the setting and atmosphere it invokes, and while I haven't played the wargame for many years I still play the 40K roleplaying products also produced by FFG. I think that's what drew me to Forbidden Stars; the promise of new adventures and experiences in the 40K universe was too much to resist and I set about securing myself a copy. When it arrived and we unpacked it I was somewhat shocked. It's a hefty box with plenty of weight to it so straight away I could feel it's worth - the RRP is £79.99. Upon emptying the contents I was amazed - and terribly frightened - by what we splayed out on the table - 1 rulebook, 1 rules reference sheet, 112 combat cards, 32 event cards, 20 order upgrade cards, 24 objective tokens, 36 structure control tokens, 32 order tokens, 4 reference cards, 1 round tracker and marker, 1 first player token, 36 asset tokens, 16 custom dice, 12 combat tokens, 4 materiel dials, 12 double-sided system tiles, 4 faction sheets, 4 warp storm tokens, 35 plastic structures and 105 plastic units for Orks, Space Marines, Chaos Space Marines and Eldar. You get these great stands for the ships, as well. Amazed because there was so much; frightened because there went my hopes for a simple board game. Lets get two things out of the way - firstly, this is a FFG product so the first thing you expect is quality, and this game succeeds in every level. The box is hardy and strong so it'll last a long while, the tokens and cards are of thick and durable card stock so they're quite hardy, and the figures are well designed and detailed, and will prove a bit of a challenge to the painters of the hobby. I do, however, have a one complaint about the contents and that's the design choice for the units of the different races. We get some lovely structure, starship and war machine miniatures, but the models for the ground troops are like standards and are not actual representations of the races. So, for example, instead of an Ultramarine figurine we get a symbol on a stand; I would have liked to have an actual figure in a combat pose getting ready to get into a fight instead of the symbol as that would have looked great on the board along with everything else, and would have been great for the painters in the room. The second thing is that the rules are somewhat complicated and I'm loathe to go into any great detail in this review, so I'm going to link to the FFG website where you can download and read the rules for free. That's something I like about the FFG range, the fact that you can have a look at how a game works before making your choice. These detailed and component-rich games can cost a pretty penny so it's great to be able to see what your getting for your hard-earned cash and if the game will suit you or not. Rest assured that I've not yet played a FFG game that I've not considered worth the money, and Forbidden Stars definitely falls into that category. It's definitely worth the price - you can feel that in the box - but it's also a lot of fun. I'm going to say this again so that it's fully out in the open and you'll understand where I'm coming from for the rest of this review; Forbidden Stars is complicated. You're not only getting plenty of stuff in your box, you're also getting a detailed and comprehensive game that'll take you an hour or two to get into. Once you get that first game out of the way it'll get easier, I promise, but expect a lot of page flipping and exclamations of 'what does that even mean!?!' as you hit the learning curve. Perhaps that's just me and the friend I played with, as one of us had the rulebook and the other had the rules reference, so as we worked through the book and set the game up and learned the rules one of us would read from the rulebook and the other would clarify what the rule meant using the rules reference document. The rules reference document was a handy tool as it detailed each section of the rules in alphabetical order so that you could find what you needed as you required it, but without the rule book you couldn't understand the full context of those rules. Sounds complicated? Well, it was. Perhaps what we should have done is just follow the rulebook and leave the rules reference for the actual game. It was a bit muddled, and sometimes we had to see the rule in action on the board to fully get the gist of it, but it all made sense in the end. No doubt there are board gamers out there who the rules will click with and they'll sail through the rules and the game itself with a smile and dismissive wave of the hand to us feeble ones who struggled, and well done you. 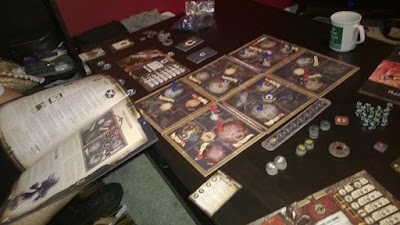 All I can say is that it took us the better part of an hour to get the pieces out of their cardboard holders, set up the board and get through the rules so that we could get on with an actual game. Even then the first round of play took us nearly an hour as we had to check and double check that we were not only doing it right, but that we were doing it in the right order and the pieces on the board were positioned correctly to allow us to do it. That's a long time in my book and starts to bend my rules regarding what makes a board game fun for me. However, once we got into it the game was, for all the bluster over learning how to play the thing, a lot of fun. We placed out figures and tokens, and set about moving our pieces, building structures, gathering resources and improving our forces. In fact, resource management and building was the order of the day at first and we were tempted to call it 'Logisticshammer', but once we got into grabbing planets from each other and having battles, things got really interesting really fast. There are objective tokens that players put around the board and these tokens are specifically for one faction to get hold of, so you find yourself fighting for worlds to make your way to the token, fighting for it, and then moving on. The sheer insignificance of entire worlds in the 40K universe, something that makes the grimdark of the 40K galaxy so well defined, shines through in this game as there may be a world you'll fight tooth and nail for, and then in a round or two it will have served it's purpose and you'll pretty much forget about it, even allowing other players to take it. Also, the order tokens that everyone places in turn are a great way of cranking up the fun as you do not have any idea what is coming next. Players take it in turns to secretly place their tokens face down on a single board section, and the player after puts there's on top so that they stack up. Then you flip the token over from top to bottom, revealing orders. So, your order to build in one area could be ruined by the previous player's order to invade before you have the chance to. It makes you really think about what you really want in a system and what orders you place across the game board. Between us as just a two-player game it was a lot of fun; a full four-player game must be awesome to play. If it does go into combat that's almost a mini-event in itself and sits apart from the rest of the game. You use the dice and the cards and battle it out, and the rules are a little clunky and this is where we had our more 'what the hell?!?' moments, but once you iron out the problems and go through it a few times you soon get used to it. I'd suggest playing the combat separately a couple of times before getting into the game proper just to make sure that you've got your head around it, or there may be a chance that combat will slow the game, which might be annoying if there's more than two players at the table. What we got from our first evening's play was a bit of frustration followed by head-nodding as we finally understood what we were supposed to do, followed by some tentative steps. After a couple of hours we were playing with confidence and after three we were going along at a pretty good clip. The following night we were much better prepared and after half an hour we'd set up the game and we were conquering worlds and I was spilling blood for the Blood God with a smile on my face and a song in my heart. All told, between the two of us, I think it took about three hours from unboxing to finally get the game and be comfortable with the rules. Yes, it was a bit of a pain to learn but it was worth it for the hours of fun we've ended up having. 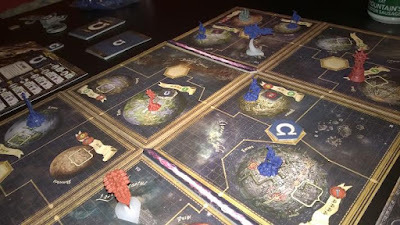 Forbidden Stars is a great game and will appeal to the type of board gamer who likes some complication in their rules, as well as the 40K fans out there. Players will find it a good social game that will have everyone second-guessing seriously strategising, and the uncertainty - thanks to those order tokens - will create not only some tense situations but also some genuinely laugh out loud moments. Who would have thought that a grimdark future of madness and death could be so much fun?